Northern Province, with a total area of 147,286 square kilometers, is the largest of Zambia's 10 provinces. It shares borders not only with three other provinces - Central, Eastern and Luapula, but also with three countries as well - the Democratic Republic of Congo in the north, Tanzania in the north-east, and Malawi in the east. Rivers, streams and dambos criss-cross the province in profusion, posing yet another great challenge to easy movement of people, goods, and services. The most prominent river on the eastern side is the Luangwa, which has its source in the Mafinga Hills, and which has no road across its valley for a distance of about 800 km. Africa's second longest river, the Congo, has its source in Northern Province via its longest tributary, the Chambeshi River, which rises in the hills south-west of Mbala and divides the province diagonally as it meanders to Lake Bangweulu in the south-west. During times of very heavy rains, these rivers, particularly the Chambeshi and Luangwa, spread across floodplains often several kilometres wide, and create large tracts of both seasonal and permanent lagoons and swamps along their valleys. The Chambeshi feeds the largest wetlands of all, the Bangweulu Swamps and floodplain in Mpika and Chilubi Districts, known for its Lechwe and birds among other wildlife. According to the 2000 Census of population, Northern Province has a population of 1,407,088. This represents an increase of 481,233 from 925,865 in 1990. The annual population growth rate is 4.3%, which is the highest of all the 9 provinces. 50.5% of the total population is female and 49.5% is male. Children below the age of 15 make up 49.5% of the population in the province. 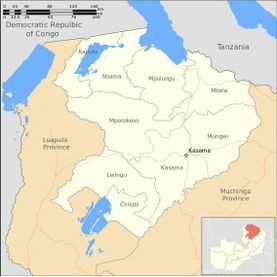 Kasama, the provincial capital, is home to 12.8% of the population, which is the highest of all the 12 districts. Next is Mbala with 11.5%, followed by Nakonde with 10.9%. In terms of the annual population growth rate per district, Nakonde ranks first with 11.9%, seconded by Mungwi with 6.6% and then Mporokoso with 6.0%, while Luwingu has the lowest with 1.5%. The rest are as follows: Kaputa 5.0%, Mpulungu 4.1%, Mbala 3.8%, Chinsali and Kasama 3.7% each, Chilubi 3.0%, Isoka 2.0% and Mpika 1.7%. The population is predominantly rural, with more people living in the rural areas than in the urban centres. The rapid annual population growth is attributed to various factors. For instance, the high growth rate in Nakonde is due to the free cross-border trade between Zambia and Tanzania, which has triggered rapid settlement in the district. The high economic potential of the Chambeshi River valley, especially in agriculture, explains the rapid growth rate in Mungwi, while the 6.0% for Mporokoso is attributed to the influx of refugees from DR Congo. Template:Tone Northern Province has poor communication infrastructure. The telecommuncation facilities, which were obsolete until 2005, have somewhat improved with the introduction of cellular phone services in all 12 districts. Prior to this, the situation was so bad that it was easier to make a telephone call outside the province than to any other district within the province as the telephone facilities in these districts were often out of use. However, these cellular phone services are quite costly for government ministries to afford. The Provincial Minister (appointed by the President of Zambia) is the political head of the province, and is assisted by the Provincial Permanent Secretary, who heads the Civil Service and coordinates the activities of all the government departments in the province. The Permanent Secretary is in turn assisted by the provincial heads of the various government departments. The administration at district level is headed by the District Commissioner (appointed by the Republican President), who combines the role of political head with that of overseer of the Civil Service in the district. Each government department has a district head, while the municipal and district councils are headed by Mayors and Council Secretaries respectively. This page was last edited on 2 November 2016, at 13:07.